More volunteers paint at Children’s Services. 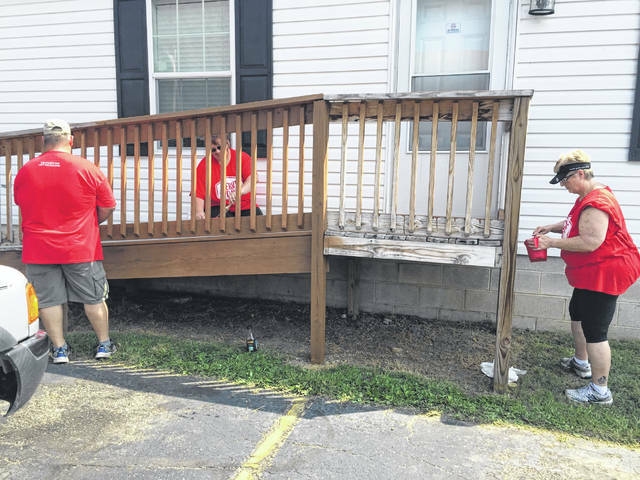 Volunteers stain a deck at Children’s Services. Kelly Marcum and Shane Blankenship clean up a retaining wall. Lucas, Amy, and Oakley Albrecht prepare for Senior games at Riverview Retirement. If you were seeing red on Saturday, this time it was for a good reason. 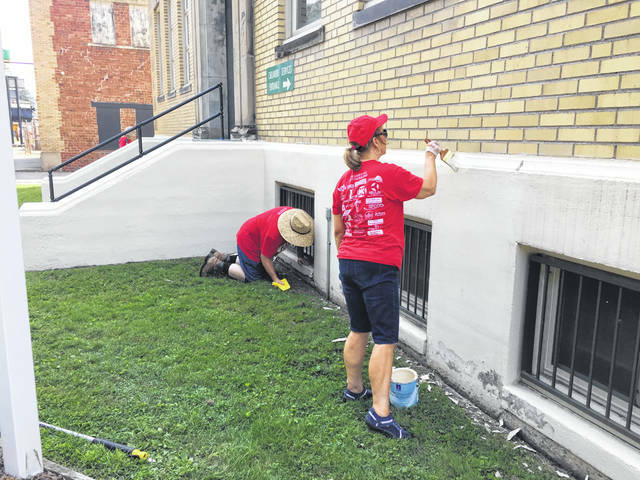 Serve Day, an annual community service project orchestrated by Life Point Church was held Saturday with hundreds of volunteers wearing red Serve Day T’s flooding the city working on various projects. Serve Day kicked off at 9 a.m. at the Portsmouth Municipal Stadium, where the volunteers from dozens of different churches and organizations came together in prayer before setting off in groups to get to work on their assigned projects. The projects taken on by those volunteering on Serve Day, ranged from planting flowers, to assisting the elderly, to painting and maintenance of area buildings and parks, to hosting fun activities for members of the community to partake in. 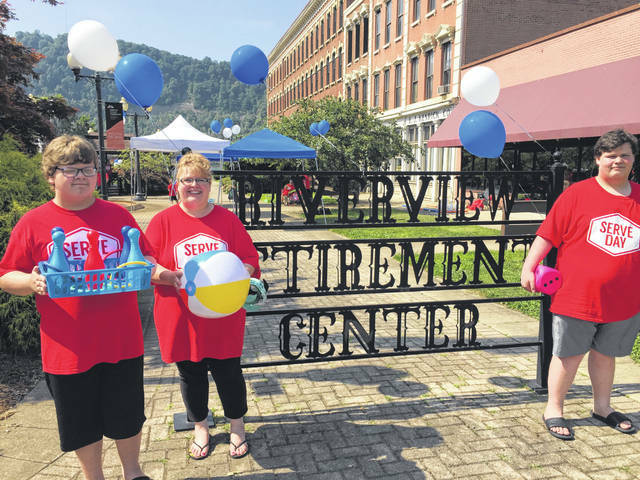 One group set up at Riverview Retirement Center and hosted a day of games and prizes for the residents there.“Our project for Serve Day is senior games,” said Wendy Williams of Life Point. “Today we’re having free food and lots of games, and when residents from the retirement home win a game they will receive a ticket that they can turn in for a prize. Our goal is to let everyone win something today and take home a prize.” The games included bingo, checkers, volley ball, noodle ball, golf, ring toss, while a dance contest, a hula hoop contest, a “spin to win” game, and a photo booth were also on site. 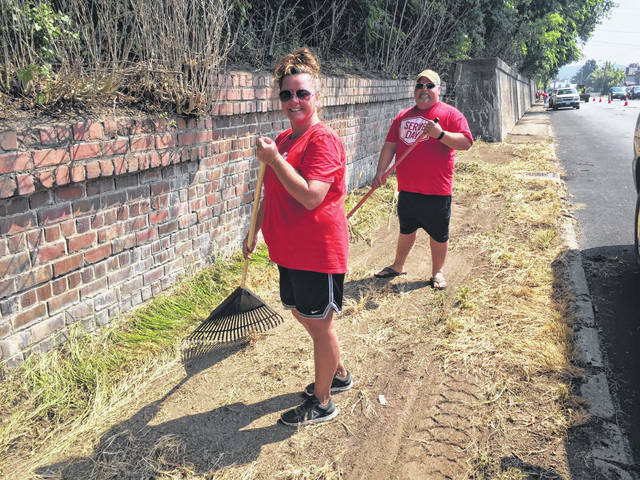 Shane Blankenship and Kelly Marcum were two of the volunteers hard at work on cleanup of a retaining wall on Gallia Street. While Marcum said this was her first Serve Day, Blankenship was raking in his third. “I think everyone should participate in Serve Day, we’ve had a lot of churches come together today, 30 or more. There are projects scattered all over that people are participating in,” said Blankenship. Some of the projects being completed for Serve Day even stretched into New Boston, with a handful of volunteers spending the day painting outside of the Children’s Services Building. One of those volunteers was Susie Beaumont who stressed the importance of giving back. “I just like helping the community, and I think it’s important because the community gives back to us,” said Beaumont.